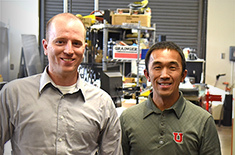 Mechanical Engineering assistant professor, Owen Kingstedt (principle investigator – PI), Mechanical Engineering associate professor Kam Leang (co-PI), and Mining Engineering McKinnon Endowed Chair Professor Kim McCarter (co-PI) have been awarded a Research Instrumentation Fund (RIF) grant from the Utah Office of the Vice President for Research. The grant, totaling $195,000 is supplemented by a substantial cost match of over $60K provided by numerous faculty members representing multiple departments and colleges across campus, and a generous educational discount from Hadland Imaging. The Shimadzu Hypervision HPVX2 camera will be housed in the Mechanical Testing Center of the Department of Mechanical Engineering and will be available to all university researchers. The camera will bring advanced imaging capabilities to the university with frame rates of 1 million frames per second and beyond. With the camera, dynamic events will be captured in high-resolution at the fastest rates possible. Such events of interest include impact, supersonic fluid flow, high-rate deformation, combustion, failure processes in composites, and high-frequency MEMS device characterization. The camera will be arriving on-campus in late summer 2017.